There’s a terrific radio drama series available via torrent over on RadioArchive.cc. 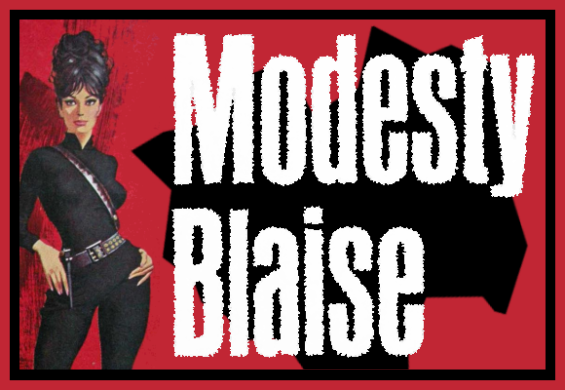 Broadcast late last year on BBC Radio 4, December 17 – 21, 2012, Modesty Blaise: A Taste For Death is truly lovely listening! I listened to the entire five part serial two or three times. That’s something I rarely do. Yet even after multiple listens this program has left me wanting more. Blaise, as voiced by Daphne Alexander, is a confident, mysterious, and thoughtful secret agent. The supporting cast is top shelf, as is the sound design, editing, and music. This show is unmissably great. In tone it’s probably not what you expect, being more of a cozy version of The Sandbaggers than a feminized James Bond. Not campy, exactly, as it is far too reverent for that. Indeed, this particular adventure features far more than just 007 style espionage, romance, and action – it features friendship, teamwork, kindness, thoughtfulness, and a light-handed touch. Best of all the producers aren’t at all above teasing the audience – the very first sounds from episode one are a total tease! Also cool, Modesty Blaise: A Taste For Death seems to be set in the period the novel of the same name was written (1969). Blaise, a child escapee from a WWII era displaced person camp, drives a “Jensen” (in my mind it’s a Jensen Interceptor). She’s glamorous, intelligent, rich and very, very cool. Modesty Blaise has been called the female James Bond but she’s much more interesting than that. With her expertise in martial arts and unusual weapons, the ability to speak several languages and her liking for fast cars, twenty-something Modesty became a female icon long before the likes of Emma Peel, Lara Croft, or Buffy. In Stef Penney’s brand new radio adaptation of Peter O’Donnell’s novel, Sir Gerald Tarrant, Head of a secret British agency, tempts Modesty out of retirement and into a job involving a young woman with extra sensory powers, an exotic desert location, and a larger than life public school villain, intent on murdering his way to a vast fortune. With its perfect cocktail of glamorous settings, hidden treasure, a twisting turning plot, and characters to root for, A Taste for Death is an action packed treat – and a guilty pleasure. With an original score by Goldfrapp’s Will Gregory, arranged by Ian Gardiner, and performed by the BBC National Orchestra of Wales, conducted by Ben Foster. And here’s the movie trailer, yikes!